This article came about as a result of the speed mapping contests held at map-center. The idea is to make a complete map in 1 hour. 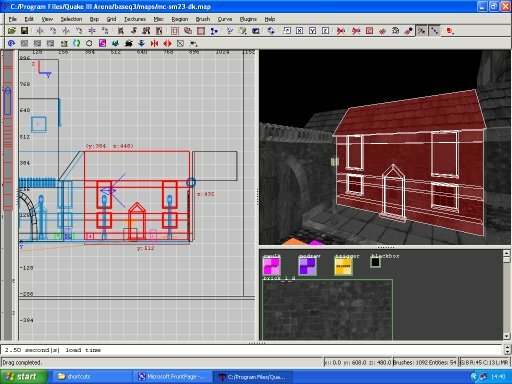 Custom material can be used, but planning and building must all be done with in the allocated time. Once completed, speed mappers gather on a server and play their maps. After event number 23 I was amused by comments from some players that my map could not have been made in an hour. With this in mind, I decided to explain the process I go through to achieve my results. 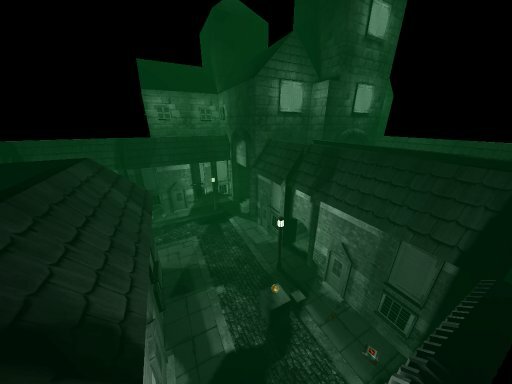 The above image is an in game shot taken from the map in question. It cant be done, you must have cheated! The holy grail for speed maps is good looks and a great layout. This is something that I personally have not achieve to my satisfaction. The above map has good looks, but has a very basic layout. Right, so it isn't q3dm6, but how come it looks like it took so much longer than an hour to make? The answer is you have to cheat. I don't mean cheating in the sense of breaking the rules, I mean cheating in the sense of finding ways of making the map look much better than it is. 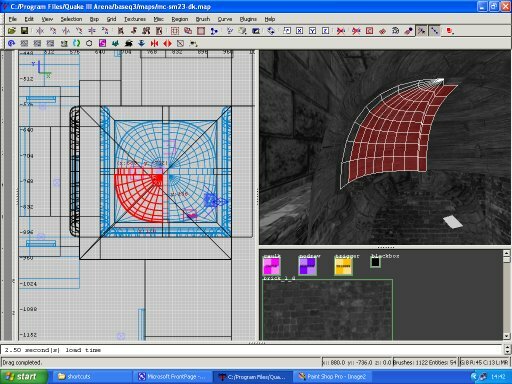 The first thing is to know and understand Quake 3, Q3map2 and have some idea about shaders. You need to prepare textures and shaders that will achieve the effect you want in game. Preparing materials is perfectly fine. For this level I had a set of textures I was working on for a Quake 4 level, that I converted for this purpose. When geometry is limited, lighting is vital. The map was not planned on paper. In my head I always have several ideas for levels floating about. I pretty much knew how I wanted this to look. The level was going to be black and white, like an old Film Noir. I thought a dark green fog would give a really good contrast and a course, grainy quality, just like a 1950's movie. Strong dramatic shadows cover up so much, and give the map an immediate 'wow' factor. I knew I wanted gas street lights so I made a lamp texture that had a good clear alpha mask. When the light source travels through the texture and strikes brushwork that has its lightmap resolution increased I knew I was going to achieve some interesting effects. The map required a black sky to increase the impact of the lighting. I had a black skybox from earlier maps already to use. From past experience I knew that that box cast light from a pleasing angle, and would need the -gamma switch set to 1.5 for compiling. Before starting, I know what I want to do and I have the tools ready to do it. BUT, how do you get so much done in an hour? The wall on the left needed to be different heights. Instead of making 2 brushes, one did the job. The floor that the player spawn points are sitting on goes right underneath the wall on the right. This way I could use the same brush to fill the floor area around the corner of that corridor. Although the map in question looks cool, its build quality is poor. The truth is actually that I almost ran out of time and had to through a hollowed cube for a skybox around the entire map. hmm, ok, but all those details? When the map geometry is done I quickly add items. For the sake of speed I tend to place ammo near to weapons. That way I don't forget what I've placed already. I aim to spawn players evenly apart, and to have one weapon per area. Health and armour can sometimes be a little random, but generally I aim for an even spread. Compiling can take a long time. It is not always necessary to run vis, but usually I do. I always run a light compile, and try to judge the settings I think will look best and take the shortest time. For the sample map I used -fast -patchshadows -gamma 1.5 -samples 4. To make the pk3 I use map packer, then add my custom arena file and level shot. Pretty much that's how it's done. The end result looks so much more than it really is. Know how to use the editor and understand how Q3map2 can work for you. I'm not saying this is the only or even the best approach to speed mapping. 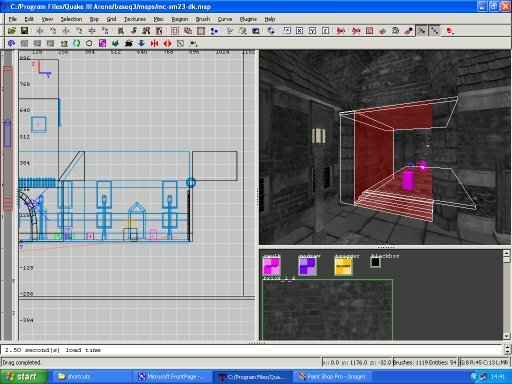 As with normal level design, each author has their own style, this article is intended to give an insight into mine.